TALKInternational.com hosts a Facebook discussion group so our visitors may interact with others concerning important issues. This is a great place to ask questions, be inspired, help others, and learn. We don’t allow spam or unrelated messages. Join our Facebook group today and stay connected . This group was created by TALKInternational.com as a way for the public and holistic health professionals to participate in meaningful discussions, connect, and learn from each other. At TALKInternational.com, we encourage our visitors to think for themselves, become empowered through education and develop a discernment for recognizing what may serve them best. This group is for consumers, patients, and health professionals. It is starting as an open group and may convert to a closed group at a later date. We welcome the public and health professionals to post and discuss topics related to alternative health therapies, integrative medicine, or biological dentistry, including information about upcoming events, seminars, and other educational and personal development opportunities. We encourage you to share experiences, recommendations, and resources. We encourage you to ask questions – and provide answers. We hope to keep posts and discussions positive and supportive. Lively conversations are to be expected, often with differing points of view, but let’s reflect the caring and truthful aspect of holistic living. Please be respectful. 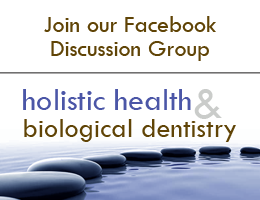 If you want to learn more about holistic health, biological dentistry, and other related topics, we encourage you to like and follow our Facebook page: http://www.facebook.com/dentalamalgam . • Please do not post conspiracy theories, *personal* religious or political beliefs. Posts about current legislative activity or other political actions related to holistic medicine or biological dentistry are welcome (for example, EPA or FDA actions, health freedom issues, etc.). • Don’t use this board for commercial purposes. Discussions about particular products will be monitored for promotional activity. • Do not use offensive language. Please practice the Golden Rule: If you wouldn’t want it said to you, don’t say it here. Group members who break these rules repeatedly will be banned. DISCLAIMER: Any medical information posted in this group is provided as an information resource only, and is not to be used or relied on for any diagnostic or treatment purposes. This information does not create any patient-physician relationship, and should not be used as a substitute for professional diagnosis and treatment. Please consult your health care provider before making any healthcare decisions or for guidance about a specific medical condition. TALKInternational.com expressly disclaims responsibility, and shall have no liability, for any damages, loss, injury, or liability whatsoever suffered as a result of your reliance on the information contained in this group. TALKInternational.com does not endorse specifically any test, treatment, or procedure mentioned in the group.